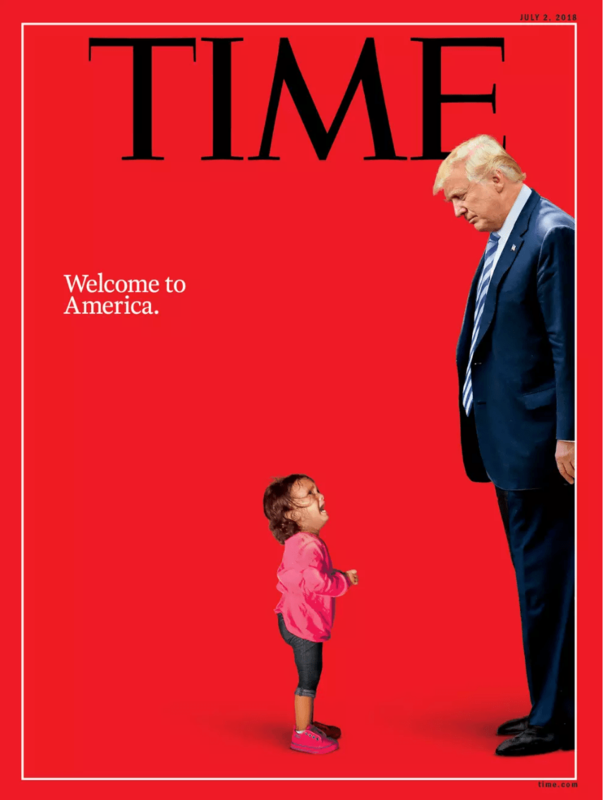 “On the left, we have the Time Magazine Pathos Shriek-Out, the photoshopped-in-our-collective-mind’s-eye image of Evil Trump “separating” toddlers from their families — except, of course, that the crying two-year-old (above) was never separated from her mother; and, of course, never met Donald Trump. Note how Time stands by its propaganda: “Our cover and our reporting capture the stakes of this moment,” Time editor-in-chief Edward Felsenthal said. The stakes? Perhaps Felsenthal conveyed more than he intended. Think of it: All “the stakes” that are fit to print. Political warfare in this country is at a risky flash point as the Left intensifies its attacks (including outrageous harassment of Trump officials) on the remnant rule of law undergirding the shredded sovereignty of this nation. What Felsenthal confirms is what we already know: The news media are not covering this political warfare; they are themselves shareholders in what is at risk — “the stakes” — and have made themselves special operators in the psychological battlefield. Because Donald Trump is president, everything is at stake for the Left; “everything” being the stealth-revolution rooted in Marxism, which has been subverting our constitutional republic for over a century. So long as Donald “America first” Trump remains president, he remains empowered to carry out his 2016 mandate to restore the US border, regain control of US immigration policy and rebuild American sovereignty. Such accomplishments would not only make his presidency historic, they would become the basis of an American counter-revolution. The Left is doing everything it can to stop him to stop this counter-revolution. When it comes to its shock troops in the media, their role is to keep going full-Pravda, no matter where it takes them. However, that was after the father, having taken his daughter out of kindergarten in May, went on to separate the child from her family circle, including from her mother, from whom the father is also separated, and subject her to the dangerous trek north to break into the United States. Twice before, he had tried and failed, solo. After that, nothing went as feloniously planned — at least as far as the father is concerned. Thanks to Donald Trump’s MAGA Zero Tolerance policy to enforce immigration law, the father was charged and pled guilty to crossing the border illegally and was sentenced to time served — three days, which is extremely lenient given this was not his first offense. Also, under US law, the immigration officials under whose control this father had purposefully placed himself and his daughter followed federal guidelines to feed and house the poor kid, who, for all we know, may have been suffering from exposure or other maladies arising from the terrible trip her father had chosen to expose her to. Assuming the best, however, assuming that the six-year-old is fine and dandy after the trek, she is nonetheless now “separated” from her whole world in that coastal Salvadoran village where her father works on a corn farm and helps a local organization hatch sea turtles (no kidding) and is somewhere being “processed” inside the maw of US government bureacracy. Tell me who is responsible for that? According to Marxist utopia, the father bears not the tiniest share of responsibility for the grave risk and distressing dislocation he himself subjected his daughter to. Isn’t that interesting? In the eyes of the Left, it’s all Donald Trump’s fault. It’s those “U.S. officials'” fault. It’s ICE officers’ fault. It’s Kirstjen Nielson’s fault. It’s Sarah Saunders’ fault. It’s Trump voters’ fault. 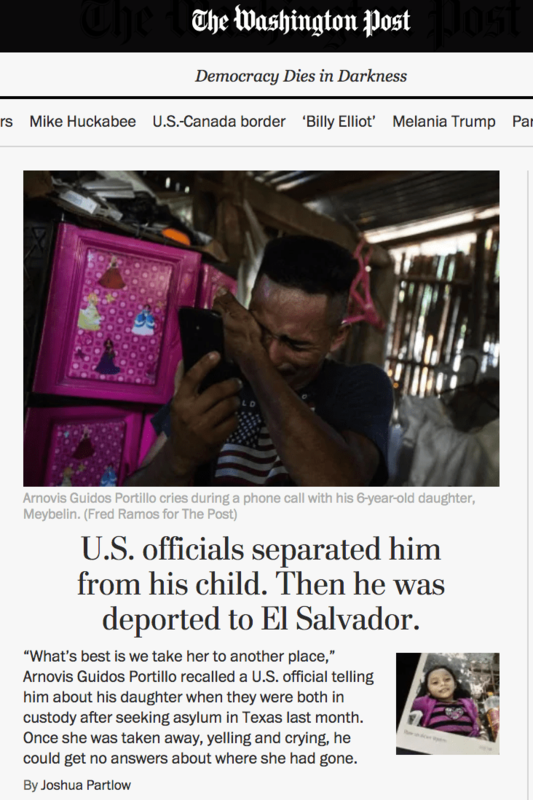 It’s as if this Salvadoran man, whom the Post has blown up in tears across its pages, has no volition, and no conscience. To the Left, he is just one of many counters, a game-piece, a button to push to activate: Get up to that border with your kids, get them to the cameras — can we get some more tears now? Can we just open the border to stop the kids from crying? For the children? Can we burn the election for the children? Can we destroy the citadel for the children? Can we also stop all thinking about the treasonous corruption of the Justice Department, FBI, CIA, Obama White House…for the children? This degrading lust for power at the expense of humanity and the pursuit of truth is the Marxism in poisonous full flower. The Post made two mistakes worth noting. It proved Trump’s Zero Tolernace works when it quoted the father, now back in El Salvador without his daughter, saying: “I would advise anyone who wants to travel to the United States with their children not to do it.” If that isn’t a made-to-order Immigration PSA I don’t know what is. Second, the paper revealed, according to ICE, that this father literally signed away his opportunity for a “coordinated removal” with his child. A spokeswoman for ICE, Sarah Rodriguez, said that Guidos, on June 19, “submitted a written request that he be removed to El Salvador without his child. Parents in ICE custody “have the opportunity to wait in detention for a coordinated removal with a child or may waive their right to such coordination,” she said. The whole story crumbles. Later, the father tries to explain his decision, something about how “he was told nothing would change,” “better to go back to your country” to get information about his daughter, but it sounds like he made another one of his terrible decisions — which, of course, is Donald Trump’s fault, too. But not such a bad thing for the Washington Post. Its reporter is right there on site with the dejected father as he walks out of the deportee processing center in San Salvador (in tears again), and climbs into the bed of a pickup truck with his other relatives for the three-hour drive to his village to wait for his daughter’s phone calls. And cry for the camera.